How to recover iPhone lost messages due to empty battery? How to recover iPhone lost messages due to empty battery? You don't have to worry, there is a method to get back all lost messages when iPhone powers off. I was texting and my iPhone died due to empty battery. i charged it thru my laptop (NO ITUNES installed) then when I turned on my phone and checked the message that I wasn't able to read before it was turned off, all my messages are gone. Please help me retrieve my messages, they're very important. Help, please! So how to recover iPhone lost messages due to an empty battery? Have you ever had the same problem here? When you are texting and your iPhone powers off, those text messages may be gone, do you have any way to recover those lost messages? Most people may hold the idea that when it comes to data loss, with an iTunes or iCloud backup, it is likely to get back those lost messages. Obviously, here is no iTunes backup for this user. So, how? Luckily, we can offer a method to help him recover lost messages from iPhone directly even though there is no iCloud or iTunes backup. 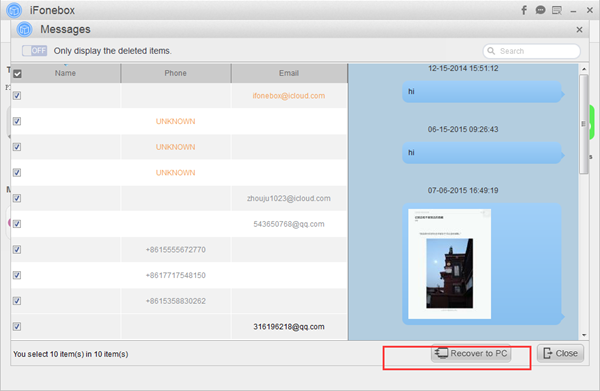 Also, compared with iTunes or iCloud backup, this method doesn't erase any data from your iPhone. Here we go. In order to recover lost messages from iPhone when powers off, without a third party software called iFonebox, you just cannot work it out easily, for iFonebox is a professional iPhone and iPad data recovery software which can not only recover deleted or lost data like contacts, notes,WeChat messages, WhatsApp, messages and more from iPhone/iPad/iPod Touch, but extract and restore data like photos from iTunes or iCloud backup. Quite amazing and compelling. It deserves the NO.1 and best choice for you when you are encountered with the iDevice data loss problem. Next, I will show you how to use iFonebox to get back your lost messages. There is no doubt that the first thing is to download and install iFonebox: Windows version and Mac version. Just pick out one to install according to your computer model. After installation of iFonebox, I will show you detailed steps to finish the process. Take iFonebox for Windows as example. Step 1. Launch iFonebox. Choose "Recover from iOS Device" mode. Please connect your iPhone to the computer so as to scan messages from it. Click "Start" button to begin. Step 2. Scan messages from iPhone. Click on Messages item and then, the automatic scanning process will start. Step 3. Preview and select lost messages to recover. After scanning, now you have the chance to preview those found messages and then, just choose those messages you need, click Recover to PC button to transfer all recovered messages. If you have an iTunes or iCloud backup for your lost messages, you have another two options with iFonebox: Recover from iTunes Backup & Recover from iCloud Backup. The process is just the same. If you need to extract message attachments from your messages, you can click on Message Attachments to get what you need. In short, with iFonebox, you can recover lost messages from iPhone when powers off. With just a few mouse clicks, all lost data from your iPhone or iPad will be found, pretty convenient and powerful. Don't you think so?